Times Are a Changing ? What one recalls from raising a child is interesting. My son, now an adult, have reminisced more than usual in the last two months. What struck me is that we have many shared cherished memories. What we recall the most are the numerous trips we took together when he was a child. We repeatedly visited some cities. Baltimore was his starter city. It was just four hours from our house and we loved the Inner Harbor area and Camden Yards where the Orioles play baseball. We spent much time in Wyoming in Yellowstone National Park and Grand Teton National Park. Boston was another city we enjoyed as Old Ironsides was a fascinating as were the many wonderful. Washington DC also holds many memories. One memory dominates my thoughts of Washington DC. Dominate is not the right word. One memory plagues me over a decade later. In 2004 I took my son to Washington DC in the spring. We had one destination in mind--the newly opened Steven V. Udvar-Hazy Center. As aviation enthusiasts, we were excited. My son wanted to get into a fight stimulator and see military aircraft while I wanted to look at the Space Shuttle and a host of other planes. The Udvar-Hazy center is massive. For the first time in history the Air and Space Museum had the space to display the finest and most historically important aircraft. We stayed near the Mall and planned to take the Smithsonian Shuttle bus to the new center near Dulles Airport. The first day the wheelchair lift work though the drivers to and fro were obviously perplexed and had no clue how to use the lift. The second day we tried to use the lift and things went wrong. It was obvious the wheelchair lift was not going to work. The bus driver was being pressured to get the show on the road. People on the bus were eager to get moving. I have written about what took place in the Ragged Edge. Link: http://www.raggededgemagazine.com/life/smithsonianbus.html The bottom line is I crawled up the front steps of the bus and onto the nearest seat. I am haunted by this. My son and I still talk about what happened. We wax and wane. Sometimes he feels guilty. He just wanted to go to the museum. Other times he thinks I made a mistake. I vacillate to this day about what I did. Of one thing I am certain. Not a single person on that bus gave a damn that I had to crawl on the bus or be left behind with my son. In this regard, my son and I are in total agreement. No one on that bus cared about my right to get on the bus. Fast forward to last Friday. I am settled in New Haven and over the course of the last eleven days have enjoyed my time. I am tremendously impressed with Yale's Sherwin B. Nuland Summer Intensive in Bioethics. This is not a surprise as I have sent two former Syracuse honors students to the program. This summer I am a seminar leader and ave enjoyed my time with my fellow seminar leaders and students. I am particularly drawn to the fact 58% of student are from abroad. The director of the summer program, Lori Bruce, has been proactive in insuring the program move forward as smoothly as humanly possible. The program has many moving parts and Lori Bruce has done a masterful job. She has bent over backwards to insure access issues are not a problem--or as least problematic as one can hope on the Yale campus where wheelchair access remains a challenge. I assumed I would be forced to stay in the dorms as an accessible sublet in downtown New Haven is akin to a needle in a haystack. The dynamic Bruce actually found an accessible sublet with air-conditioning within a mile of where we would be meeting over the month of June. I was not just impressed but astounded. On Friday we were taking a trip to the Hastings Center in Garrison, New York about two hours away. Bruce had arranged for two coach busses for transportation. I was deeply skeptical. My experience with coach busses is overwhelmingly negative--hence the story above. 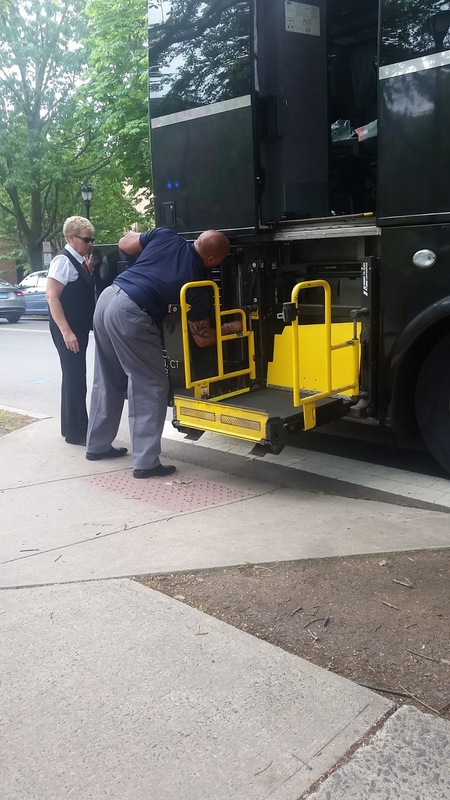 Coach busses have lifts but I would estimate that when I try and use the wheelchair lift located in the back it does not work 95% of the time. The norm is for the bus driver to attempt to get the lift to work and if it is not operational within 10 minutes I am left by the curb side. Bruce made dozens of phone calls during the week to the bus company. Pressure was brought to bear. The bus we expected would have a working lift. My fingers were crossed but I expected trouble. Trouble we got. Two coach busses appeared on time. The wheelchair lift on the first bus did not work. The wheelchair lift on the second bus did not work. This is exactly what I expected in spite of Bruce's efforts. Thirty minutes pass. An hour passes. The lift on both busses are not working. The driver is upset. There is much milling about. Bruce spent much time on the phone. The bus drivers are consulted repeatedly. They assure us the lift was cycled the night before and just hours before the bus left the depot. After and hour has passed, I suggested to Bruce the busses leave without me. I have been to the Hastings Center. It would be wonderful to reconnect with the research scholars I know but the trip is not imperative. I get an absolutely no from Bruce. We are all going--end of discussion. Based on Bruce's body posture, stern look, and dedication to insuring the program be as inclusive as possible I knew this is not a subject of discussion. I told Bruce I deeply appreciate the solidarity but we have nearly 70 people on two busses many of whom have never been to the Hastings Center a leading bioethics think tank. I was willing to fall on my proverbial sword. However, I did wonder is this 2004 all over again? Will I watch two busses depart while I am left at the curb? I am not crawling on the bus--that is a certainty. If this is an all or nothing decision I have a hard time believing 70 other people are willing to miss out on an opportunity of this type. I wonder will people hate me or will they not care one iota. Bruce and I had a brutally direct conversation. She told me I had the unanimous support of every person on the bus. I was nothing short of stunned. She meant it as did others. I really did have the support of students and fellow seminar leaders. Without question, this is a first. Never has anything like this ever happened in my life. Here I am forced to depart from my usual Bad Cripple and undermine my moniker. There is no social outrage. Instead, I have support. A lesson in ethics took place. Many people throughout the 90 minutes expressed disbelief. How could this happen? This is outrageous. More than once I simply said, "welcome to my life" or "this is the norm in the land of disability". Nothing is ever simple and social and physical isolation remain the norm. As I feel asleep the night we got back I thought of the hundreds of planes, trains and busses I have been unable to get on and off with a modicum of ease and dignity. Never had others expressed a hint of solidarity. Not once. I will remember the Smithsonian Museum bus shuttle incident for the rest of my life. I will also remember the solidarity I shared with 70 other people. Quite the opposite experience. And perhaps it is proof that times have changed. Maybe there is hope. Maybe I will live long enough to experience a social and physical environment that bus welcomes my existence.